They have an unbreakable and extraordinary bond. Every seven years, five people are born on the same day, at the exact same time. The elements bind them; earth, fire, wind, water, and spirit. They call them, Elementris. Ava Vangeretta is seventeen years old and different. Unlike most born of the element, she was born alone. She has the power of all five elements. Ava is the first True Elementris to be born in many years. As her eighteenth birthday approaches she is faced with a choice. Give up this rare gift and live the normal life she has always craved or accept it and challenge the current True Elementris in a battle to the death. Ava's past haunts her as she struggles to decide. In her present, the seasons are colliding together, storms are destroying lives, and love is a dangerous curse. The current True Elementris is behind it all and she will do whatever necessary to keep Ava from making it to her eighteenth birthday. Ava’s decision threatens the lives of the two people she cares about most. Can you choose between love and friendship? Ava is magical, she has been able to call on magic since she was born, usually by accident. But she isn't a witch, she's an Elementris, she's Mother Nature. An Elementris being someone born every seven years on the exact same date, exact same time as four others. The five are bound through their gift, the gift of earth, fire, wind water and spirit. Only rarely is a true Elementris born, one with the gift of all five elements. Ava is a true Elementris, but it isn't a gift when all you want is normality, it's a curse. Ava, abandoned by her mother, lives with her Aunt, who shares the same name. Has always been encouraged to learn to use her gift, something her mother thought of her as an abomination for doing so. A few months before her eighteenth birthday, Ava carelessly uses a magically wish, and we meet Alec. Alex is a guard to the queen, the reigning true Elementris, and wants Ava dead. So when her house is stormed by the guard, saved by Alec, the hunt begins. Torn between the boy she has had a crush on for years, and Alec, Ava must learn how to control her powers to save the Earth and become the one true Elementris. 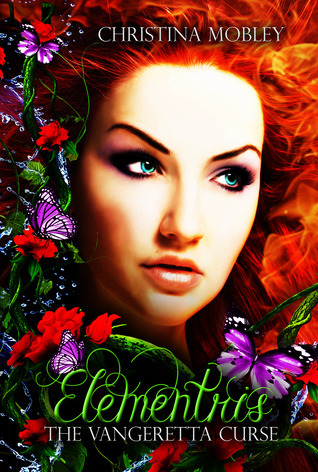 I was given a copy of Elementris from Christina (Christina Mobley, Author) and wasn't sure what to expect, as I hadn't heard of the The Vangeretta Curse series previously, but I was pleasantly surprised. It was quite good. The storyline flowed and I'm a big fan of basic writing, without lengthy descriptions and explanations, so this book was just what I needed. It was engaging and perfect for younger teen readers. This really is a case of not judging a book by it's cover. With a more attractive branding, The Vangeretta Curse series could be as popular as a Hex Hall or Darkest Series by Kelley Armstrong. I really enjoyed it and look forward to reading the next in the series. I really like what this book is about. I loved Avatar: The Last Airbender so I have a thing for people with elemental powers. I don't think I would even care if my mother didn't love me or even if people were scared of me. I'd just be like "I HAVE ALL OF THE POWERS!" and I'd make sure no one could try anything because they couldn't. Comparing it to Hex Hall makes me even more intrigued. Consider it added.